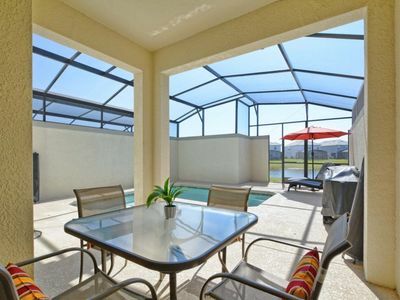 Villa Sunrise Dream is in Kissimmee on the exclusive gated community of Sunset Lakes, only 4 miles from Disney. 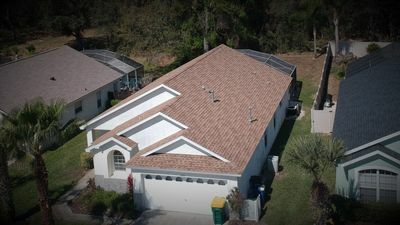 The Villa backs onto a stunning lake and offers over 2600 sq ft of living space with 2 king master suites, 3 further bedrooms, 3.5 bathrooms, fully equipped kitchen, breakfast nook, family room, formal lounge, private pool with kiddies area, hot tub, large deck, lanai and ceiling fan, Games room and utility room with separate washer and dryer and WiFi. 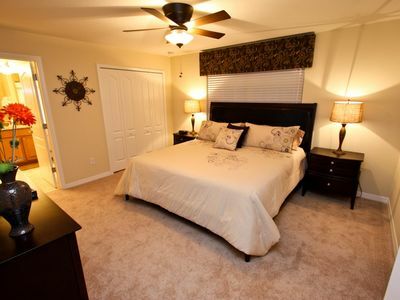 The 2 spacious king master suites each have enormous en-suite bathrooms with luxurious bath, walk-in shower, twin vanity units, walk in closets and also Cable TV. 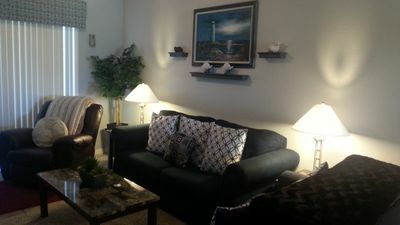 The 2nd floor suite has its own private balcony overlooking the stunning lake, the lower suite has patio doors to pool. 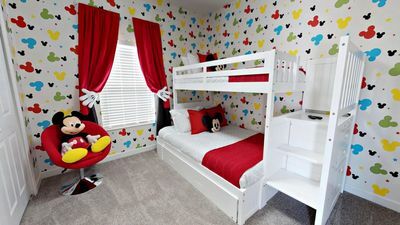 There is also a further queen bedroom, and 2 twin bedrooms (lower floor twin is Disney themed), 3rd full bathroom and 4th restroom with vanity unit. 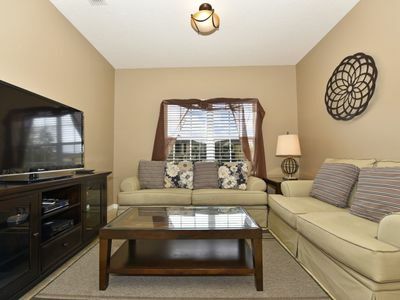 There is a vaulted ceiling above the lounge and galleried landing. We spent many long hours finding the perfect home. 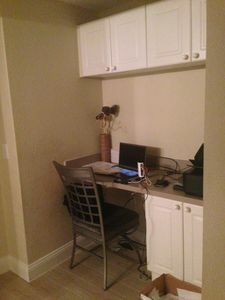 We walked through the door and found everything we had been looking for and more - luxury, space, comfort and everything we could possibly imagine, all in the perfect location. Then we saw the lake views - Wow! We knew then that no other house would do! 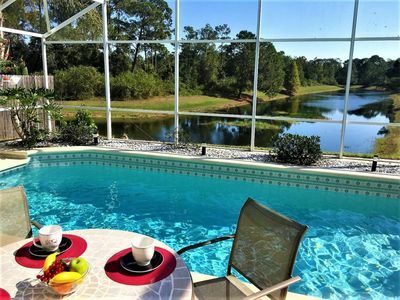 Now you need look no further, you have found the dream home for your perfect vacation. 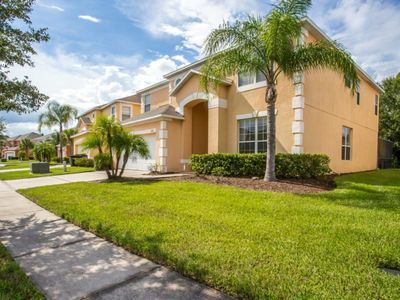 Set on the exclusive community of Sunset Lakes, our Florida home, Villa Sunrise Dream, is perfectly located, within minutes of the magic and entertainment that is Orlando and yet is a peaceful haven of tranquillity with stunning lake views to return home to and enjoy. 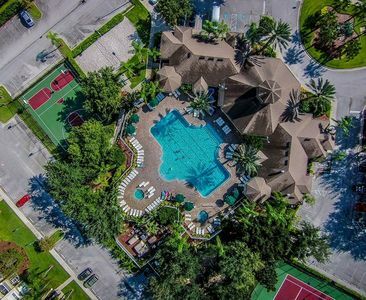 Once you have stayed in our fabulous home in this outstanding community you will never want to stay anywhere else. 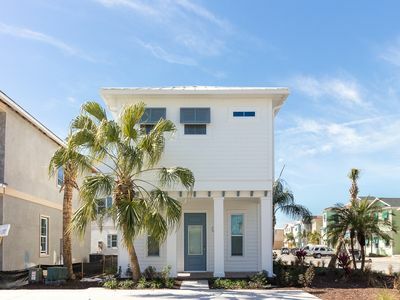 Home from home: Set around a stunning lake Villa Sunrise Dream offers 2 Floors of luxury with 2 Master Suites, 3 further bedrooms and 3.5 bathrooms. 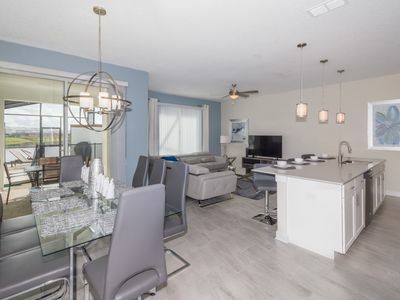 Sunrise Dream is equipped with every amenity you could need and is bright and spacious with your own large swimming pool with superb lakeside views. 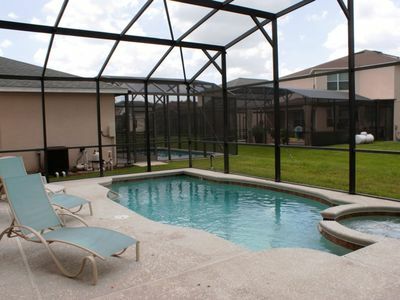 We have provided a stand alone Hot Tub, Games room with air hockey, pool table and foosball, WiFi, 6 Cable TV's, DVDs. PlayStation 2, board games, Jigsaw puzzles and mini library for all ages to ensure there is something for everyone to enjoy. Sunrise Dream provides the perfect haven after exploring the endless attractions this area has to offer. 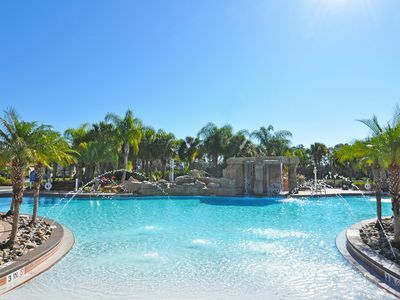 Our home is close enough to the attractions to return to for a leisurely lunch and cooling dip and rest, before heading back for your evening entertainment or show. 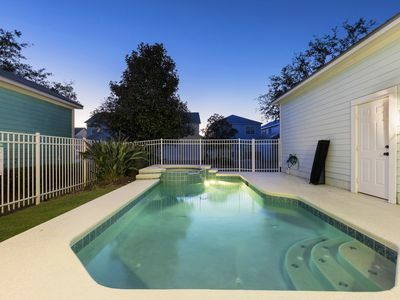 Or why not have a lazy day enjoying your pool and home. 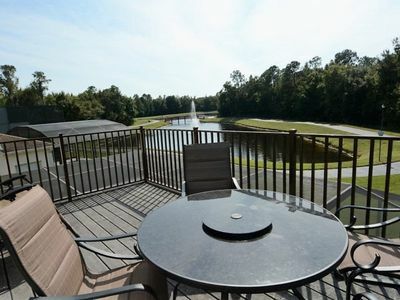 How will you spend your day: Sunset Lakes is located on west US192, and 4 miles from Disney. 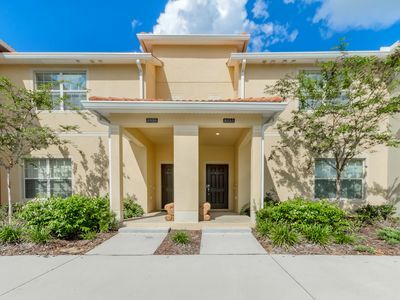 TGI Fridays, Carrabas, Giordinos, Outback Steak House, Subway and numerous other restaurants and Supermarket are minutes away. For those who enjoy shopping you will be spoilt for choice, with brand name factory outlets and wonderful shopping malls such as Florida Mall close by. 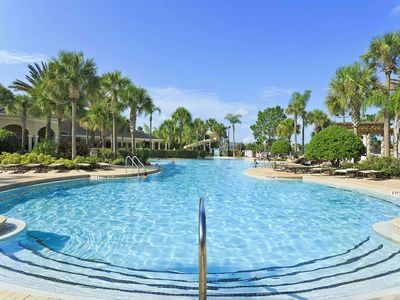 For those who wish to explore a little further afield why not visit one of the following: Cocoa Beach - takes approximately 1 hour to drive; The Gulf Beaches such as St.Petersburg and Clearwater are 1.5-2 hours away; Busch Gardens in Tampa is an easy drive, taking approximately 1 hour; The Kennedy Space Centre is 1 hour drive away, a must for budding astronauts; Port Canaveral, for short cruises is 1 hour away. This really is the perfect place for your dream vacation, with so much to do and your luxury tranquil villa retreat who could ask for more. 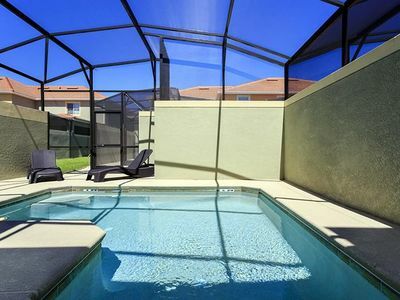 Luxury Pool Home Located at the Exclusive Reunion Resort 6 miles to Disney! 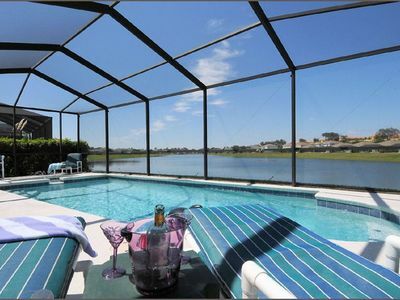 4 Bedroom Disney Orlando Private Pool Home with Beautiful Water View, Hot Tub & Outdoor Deck!